Minds in Bloom presents Renée Goularte, a former art-instructor, a working artist, and a writer, with her post on integrating art into your curriculum. If you are a teacher, chances are you’ve said it: “We have no time for art.” Chances are equally good that you believe that art is important. It is…and it’s worth making time for! Because you know what? Art education is important in and of itself, but besides that art includes problem-solving and choice-making, develops fine-motor skills and visual literacy, fosters a sense of aesthetics, taps into students’ individual creativity, and helps visual learners make sense of the world. A science teacher friend of mine often reminds people that “science is art, and art is science.” Science and art both inherently require a significant degree of observation activity. When students are learning to observe closely, that’s a great time to teach a lesson on drawing a still life that includes plants or other natural elements, such as rocks, twigs, or bones. 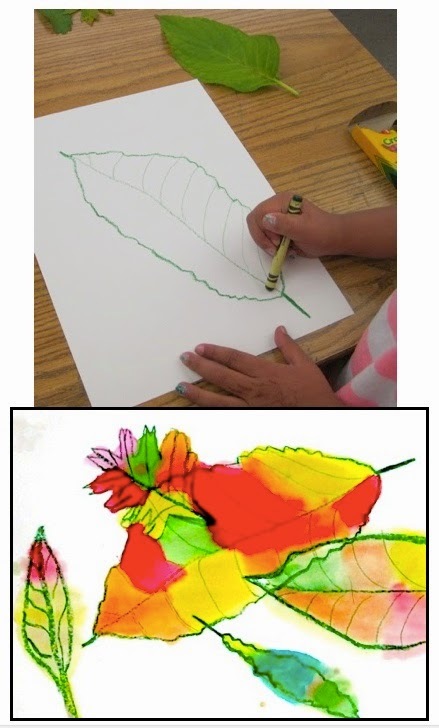 On a more discreet level, students can do leaf observation drawings and add a creative art twist with watercolor, oil pastel, or even crayon rubbings! Science units are sometimes culminated with some kind of “art project” that often includes a “craftivity,” where students cut and assemble something, like a penguin or a polar bear, for example. Teachers can easily take it further with a direct draw lesson that breaks the animal down to its essential shapes. If studying habitats, what about drawing or painting them as an assessment tool? Drawing is a great way for students to show what they know, as it encourages them to include details they might otherwise overlook. Studying the human body? What a perfect opportunity for incorporating a lesson on drawing people or doing self-portraits. Include a math component here by focusing on the proportions of a human body. A human head is approximately 1/8 of the total body height. Fractions, anyone? What if students are asked to construct 3D models, with or without plans or a template, out of a variety of materials (cardboard, construction paper, aluminum foil)? What a great introduction to sculpture as an art form! There is so much math in art! From the precision of perspective drawings to the looseness of the abstract impressionist’s shapes and lines, to the geometric use of shapes in paintings from artists like Piet Mondrian and Pablo Picasso, math and art often intersect. Math instruction can be supplemented with art lessons that include concepts from geometry, measurement, or fractions. Geometry is especially prevalent in art and vice-versa. As part of a geometry unit, students can create geometric shape collages or geometric people or animal collages. 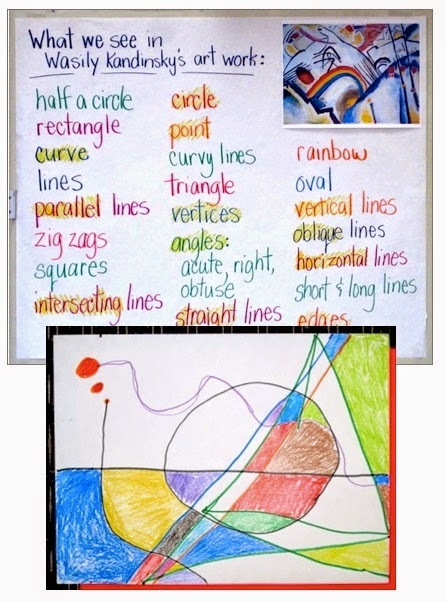 A “looking at art” lesson focusing on what students see in a Wassily Kandinsky painting includes tons of geometry vocabulary and can be enhanced by an abstract drawing in which students draw different types of lines, shapes, or angles, as dictated by the teacher — a lesson with the added benefit of developing and assessing listening skills. Add a problem-solving component by having students color half the shapes or half the total area. Then have students discuss each other’s compositions using art and geometry vocabulary, and write about them, too! Simple abstract art lessons that incorporate math include simple shape tracing activities that may use repetition, overlapping, and lots of patterning. Students can reinforce their understanding of patterns with many different kinds of art lessons and techniques such as printmaking, drawing, and stamping. An art activity as simple as tracing shapes and filling each one with a different pattern can be made very simple for younger students and more challenging for older students. Think geography, regions, and landforms. A logical connection here is to have students draw or paint landscapes. If you are lucky enough to be at a school that has mountains or other interesting landforms nearby, this art lesson can be taken outside for “plein aire” drawing, requiring students to observe the environment. Take clipboards and some colored pencils. Or draw with crayons, then bring the drawings in and paint over them with watercolors for a lesson in wax-resist, color mixing, and color theory. A common activity during patriotic holidays looks at symbols and/or has students color in American flag pictures. But there are a number of famous artists (Alexander Calder and Jasper Johns come to mind) who have used the American flag as inspiration for paintings, collages, and sculptures. 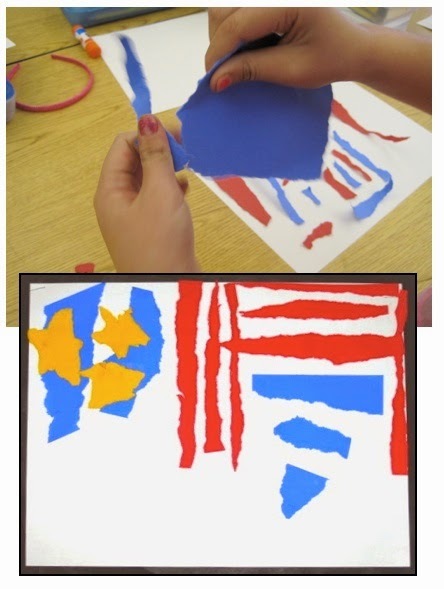 Students can look at some of these examples and create beautiful, imaginative, abstract patriotic color collages out of cut or torn paper…something just a little different, highly decorative, and even thought-provoking, if students are asked to keep the red/blue/white relationships intact. Imagine a set of these symbolic abstracts on a bulletin board that includes a Pledge of Allegiance poster! When learning about communities, students can create drawings of cityscapes, perhaps on black paper with white chalk drawings for a lesson in using negative space. For a more artistic adventure, take an extra half hour for students to do a quick watercolor wash in warm or cool colors, and then cut out their cityscapes and glue them onto the watercolor wash for a “sky” background. A lesson like this can also include patterning and symmetry, bringing in another math component! What elementary classroom teacher hasn’t asked students to draw an illustration for a story and then been disappointed with drawings that are small, incomplete, and messy? Given just a little more time and some basic instruction and tips, students can turn out quality illustrations to enhance any kind of student work. A friend once asked me to do a lesson on making book covers with his 3rd grade students because he was disappointed in the covers they were making. I had the students do some close looking at several picture book covers, did a quick overview of people drawing strategies, and made some composition suggestions, like using bold colors and large drawings. And I gave them white paper. It took less than three hours, and my teacher friend was thrilled with what they had produced, compared to their original attempts. Poetry writing lessons are a perfect opportunity for integrating art. Poetry requires the stripping away of extra language and focuses on the creation of imagery. So, why stop with the writing, especially for short poems like haiku or cinquain? 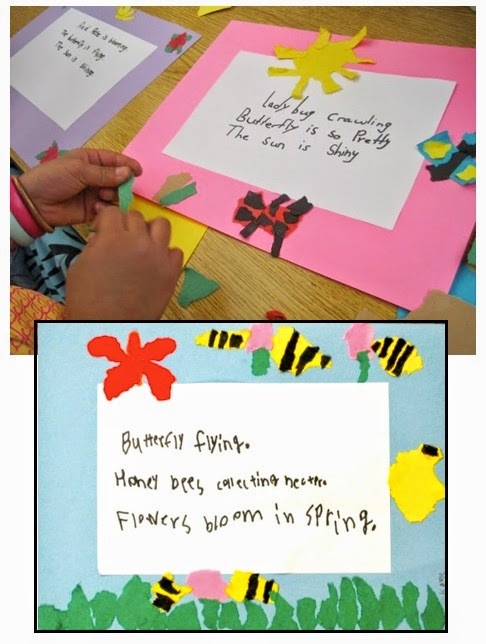 It takes little time for students to recopy their short poems onto white paper, mount them, and create a colorful drawing or collage border that depicts the content of the poem and makes a connection between the written and the visual. Looking at and talking about art, starting with picture book illustrations and moving on to great art works, can help teach, reinforce, and review language arts concepts, such as making comparisons (Picasso vs. Klee), identifying main ideas (what’s going on in this painting? ), finding details (what do you see? ), and distinguishing fact from opinion (what you see vs. what you think). Discussions about art works can build vocabulary, encourage students to talk about their observations, teach about other cultures, and give students ideas for their own illustrations and other art work. 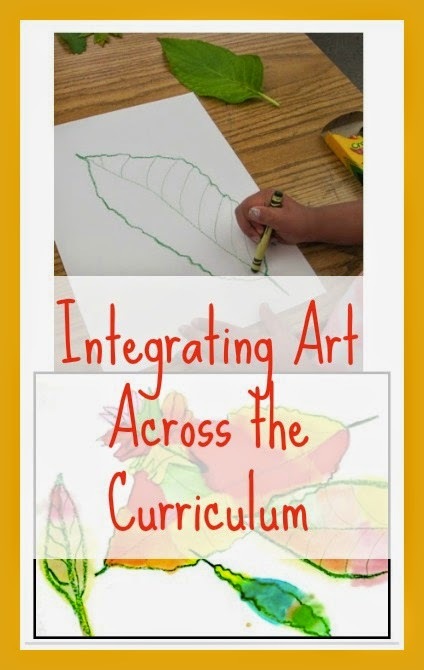 Integrating authentic art instruction across the curriculum is a win-win: It lets students express themselves, teaches them responsibility and problem-solving, gives them an alternate way to interpret and enhance what they learn, and more. Perhaps most importantly, it engages and includes those visual learners who need pictures to help them interpret and understand the world around them. Authentic art instruction requires student creativity to drive the finished product. It includes looking at famous art works as historical, cultural, and meaningful. It facilitates students to think about line, color, texture, value, and space. It increases vocabulary, generates discussion, facilitates problem-solving, and can teach respect for the ideas of others. Moving beyond simple cut-and-paste craftivities (which also develop important skills, to be sure) and carelessly-drawn stick people (a lazy habit) and into authentic art lessons that foster creativity and self-expression does not require vast amounts of extra time, and the benefits are tremendous. Asking students to think and work like artists presents opportunities that foster self-expression and problem-solving and can help them find new and creative ways to demonstrate their learning. Download my free resource for teachers, Making Time for Art, for more ideas and suggestions for creating an art-friendly classroom, and check out my blog, Creating Art with Kids, for narratives on art lessons. And go ahead… Make some time for art! Renée Goularte is a retired elementary teacher, a former art instructor, a working artist, and a writer. She has taught all elementary grades from K-5 and with special groups, including GATE, ELL, and at-risk students, and is dedicated to helping non-art teachers bring more authentic art instruction into their classrooms. 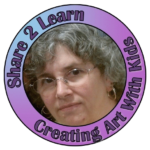 Read more about her art lessons on her blog, Creating Art with Kids, and get more ideas for integrating art across the curriculum with Making Time for Art, a free resource from her TeachersPayTeachers store. Great post. 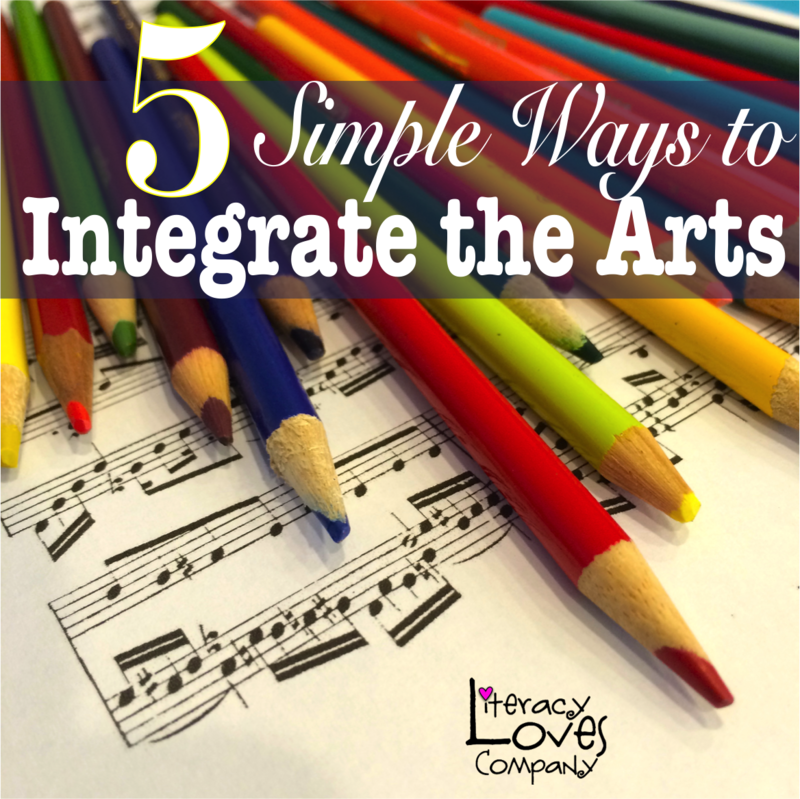 I've found most subject lend themselves to art integration if you're thinking creatively. You can pretty much take any art project idea you like and tweak it to fit a themed unit. Renee, I always love reading your words. Your passion for art in elementary school is evident. Thanks for sharing! These are terrific ideas! I especially love your suggestions on how to integrate art with math and science. Good post! Thanks for all the kind words and general kudos! And thanks to Rachel for this opportunity!